The KCEtsy Street Team is at it again for another First Fridays event in Kansas City. Taking place at Shiraz Restaurant in their Gallery Room at 320 Southwest Blvd., at Southwest Blvd. and Broadway in the Crossroads District, KC, MO. 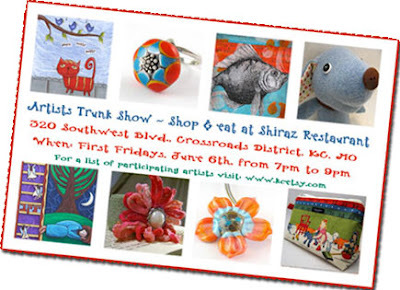 The artists show and sale runs from 7:00pm to 9:00pm on Friday, June 6th, 2008. I will be there along with 9 other local artists displaying their fine art and upscale handmade wares. Come join in the fun - shop and eat at Shiraz. See you there!